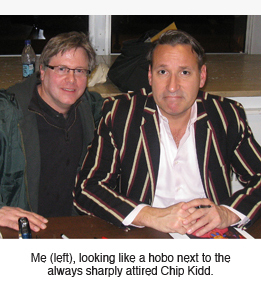 Besides his work as a graphic designer, Chip Kidd is also the author of two satirical novels which have attained a devoted cult following. Seated behind me at the presentation was graphic novelist extraordinaire Chris Ware, who illustrated the cover for Kidd's first book "The Cheese Monkeys", centering around a graphic design student's art school misadventures. His sequel, "The Learners" follows the main character, Happy, as he lands his first job at an ad agency. Both books are breezy, fun and convey the same wit and style as his book cover designs. Many thanks to Columbia College for opening the event to the public and to Chip Kidd who kindly chatted and signed books and posters following the presentation.